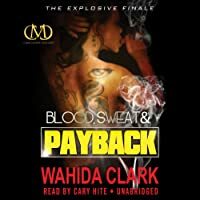 From New York Times bestselling author Wahida Clark, comes the final installment in the Official Queen of Street Literature's unrivaled Payback series. Someone wants every member of the consortium dead and they’ll stop at nothing to make that happen. Meanwhile Shan has transferred back into Redbone and has taken it to a whole new level. Nick suspects Shan is still in love with Briggen even though she is with him. Janay has turned over a new lease on life but her ties to Crystal are always a challenge. Everyone is gunning for Dark and with The List in the hands of Cisco’s wife, Joy, Dark’s chances of taking over Detroit are threatened more than ever before. Everyone is fueled by fire and seeking Blood, Sweat and Payback.